Thanks for setting up and fantastic tour. Everything exceed our expectations, we will come back for more. Andreas T.
Throughout this trip you will find the Andean Mountain packed with unique ruins, charming villages, Salineras (Inca salt mines that still is in use), the rain forest and Machu Picchu. Be ready to stop and explore the surrounding and take photographs of the astonishing views of each destination during the whole entire trip. At 8 am your tour guide and our van/bus will meet at the lobby of your Hotel. It takes one hour drive to Maras where your guides will provide a trip orientation about the mountain biking. After everyone feels comfortable we begin our ride with a nice mountain bike through a well maintained dirt road, learning about the unique environment while we travel through Moray complex. 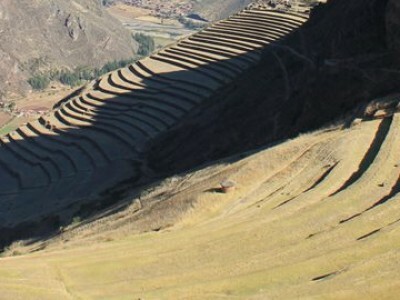 “Moray was an Inca agricultural complex, no one knows exactly the purpose of this site, but the most acceptable theory is they used to serve as agricultural research center. The temperatures between terraces can vary by more than 20 degrees”. 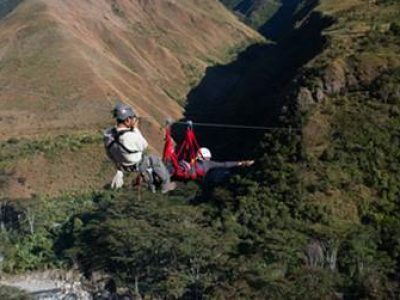 Lunch will be served after the guided tour with the view of Moray complex and the mountain range of the Sacred Valley. After lunch, we will begin the second section riding on the superb circuit of Salineras salt mines ”Salineras are thousands of small ponds carved into the mountains. This place were constructed during the Chanapata culture between AD 200 and AD 900, and has been in use since Inca times”. 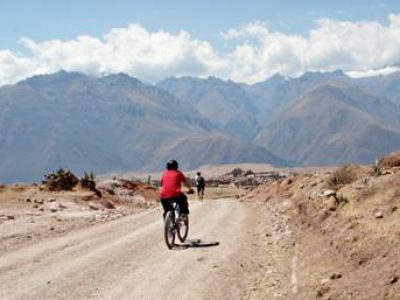 Moray – Salineras mountain biking is an activity that fit perfectly into our Machu Picchu Adventure tour and combines properly with the rafting in the rain forest and the Machu Picchu complex. Our private van will be at the end of the mountain bike circuit ready to take us to Ollantaytambo train station to catch a train to Aguas Calientes (Small city below Machu Picchu) where we will roll into our well appointed hotel. After breakfast will begin the most important day of our adventure tour. We start out early morning taking the bus up to Machu Picchu (Hiking optional, it takes 2 hours). Your guide will explain and answer your questions regarding to this amazing complex. You can choose hiking to Huayna Picchu peak or Montaña (Mountain ). *Note that entrance fees to hike Huayna Picchu and Montaña are normally sold out very quick, therefore they are not included in the price. Machu Picchu lies at 2400 m – 7874 ft, built a top of a mountain, surrounded on three sides by the outstanding views the Urubamba river gorges and the rain forest Mountains. After the tour, we will meet at Aguas Calientes and then we continue for 2 hours hiking along an empty rail road with nice views of the jungle and Machu Picchu complex until we arrive to Hydroelectric train station. At the station we will take a van to Santa Teresa. After been accommodated in our rooms, you can enjoy your Machu Picchu Adventure relaxing in the hot springs of Colcamayo (entrance not included in the price 4 USD). Rise and shine! We have a full day with warm weather and over 4 hours of great rapids to enjoy. After a nice breakfast, a private van will take us to Santa Rosa which is the beginning of our rafting tour. You guide will go through a safety orientation about commands and other safety instructions before jumping into the river. Rafting in the Urubamba rain forest begins at the end of a massive stone wall of Santa Teresa Gorge and flows into the Amazon Jungle; this section is interrupted by great white water rapids with calm water sections in between. After, the river mellows, there will be time to jump and swim in the river or simple float along with our rafts. Also included on the Machu Picchu adventure is a full delicious lunch served at the end of the rafting tour. Accommodation: One night hotel Aguas Calientes, one night lodging in Santa Teresa. 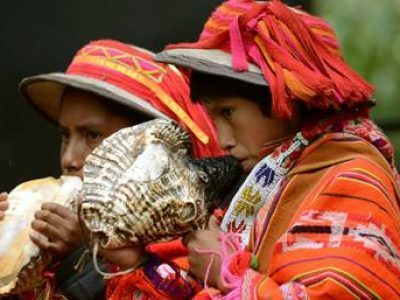 Machu Picchu Tour: Train tickets to Aguas Calientes, one way bus to or from Machu Picchu, Machu Picchu entrance fees,, public van from Hydroelectric train station to Santa Teresa. *Entrance fees for Hiking Huayna Picchu peak or Montaña are easily sold out, therefore we offer as an optional, and is not included in the price. Rafting Tour: All rafting gear such as life vest type V, helmets, paddles, self bailing boats. Guides: We will provide a professional guided thorough the trip certified in river -rafting Swift-water rescue, first aid advance course. Transportation: Private transport for all transfers, to Maras (beginning of the biking trip), support vehicle (for the people who don’t want to bike or if they are tired), bus tickets from Machu Picchu to Aguas Calientes, train tickets in backpacker service to Ollantaytambo and bus to Cusco, bikes, raft and trek. Dinner and lunch in Aguas Calientes. Entrance fees to hot springs in Santa Teresa or Aguas Calientes. Train ticket from Aguas Calientes to Hidroelectrica train station. Its included only one way bus to or from Machu Picchu. Rafting: River sandals, swimming suits, towel, sun glasses, sun block, water. Biking: Tennis shoes, pants, t-shirt, sun glasses, sun block, water. Machu Picchu: Fleece (Aguas Calientes can be a little cold), shoes for hiking (is not necessary boots, tennis shoes works also good), hat, sun block, sun glasses. Luggage: We recommend taking a small back pack with all your belongings. Peru rail is the company who operates this route and allows only 6 kg 13.2 lb. Guarantee departures with minimum of 2 people.